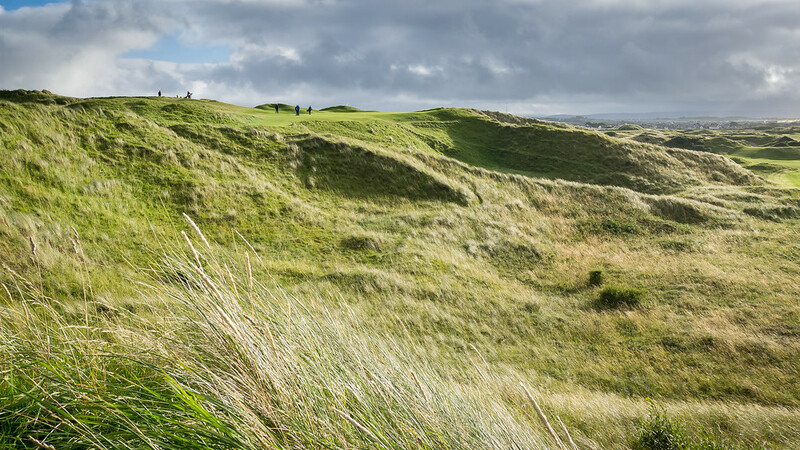 Fans of the HBO television show Game of Thrones (GOT) will quickly recognize many of the locations around Royal Portrush Golf Club. Arya Stark’s roam through the Dark Hedges, the Carrick-A-Rede Bridge and Brienne of Tarth’s victory, and Cairncastle and the beheading in the pilot. As a matter of fact, there are day-long driving tours one can do if you’d like to see as many of the GOT sets as possible during your time in Northern Ireland. So what does this actually have to do with playing golf at Royal Portrush? How could a fictional show set hundreds (?) of years ago have any relationship to playing at an elite golf club? If you are a fan of the show, you will know that a good way to describe the world in which GOT is set, is simply “cruel.” These were the days before indoor plumbing and gunpowder. These were the days of beheadings and hand to hand combat; days when men choked to death on their own blood after an unsuccessful jousting match. 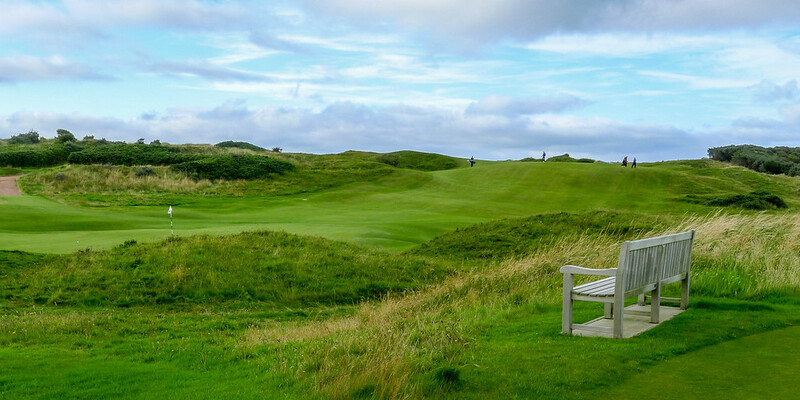 The good news is there will be no jousting at the Royal Portrush, the bad news (that of course depends on what you want out of a golf course) is that Portrush might be the hardest track you’ll ever play. I have written about difficult golf courses in the past, Coyote Springs in particular comes to mind. Many of those courses are made difficult by the extreme bunkering, the lightning-fast greens, and the forced carries. Portrush also has lightning-fast greens. The bunkering in some cases could be called extreme (the 17th hole and “Big Nellie”), but the bunkering is mostly there to punish an errant or overly-valiant shot. There are also relatively few forced carries at Royal Portrush. You can play the ball along the ground and still score well. It’s not a course that requires you to hit it a mile. It simply demands precision. The slopes of both the fairways and the greens. In some cases I’d describe the slopes as “subtle”, in other cases I’d call them terrifying. An example of the more subtle variety occurs as early as the 2nd hole. 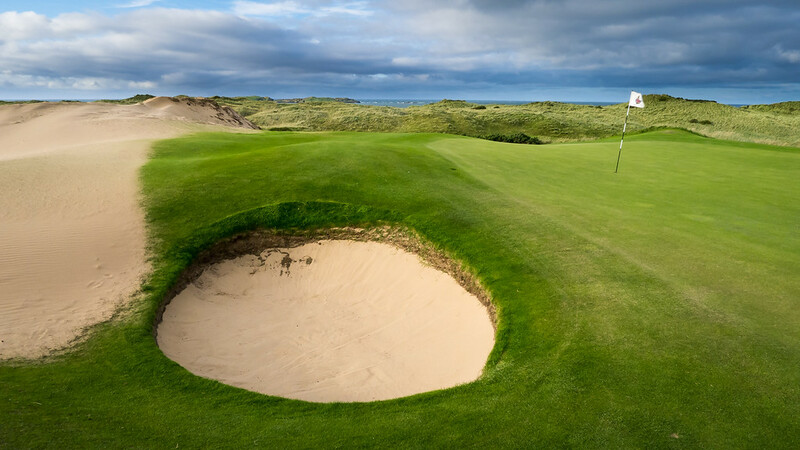 There are three bunkers in the right-hand rough lying about 190–240 yards from the white tees. I hit what I would call a “weak fade” off the tee. It wasn’t awful and it was by no means a good shot. On many golf courses you’d roll into the right side of the fairway or maybe into the first cut of rough. At Royal Portrush weak shots like that get drawn to bunkers like magnets. There are miles of safe ground to the left. If I had played the proper shot, a draw, and even overcooked it, I would have been fine. The weak shot on the other hand is roundly punished. The wind. The day I played it was probably a 2–3 club wind. 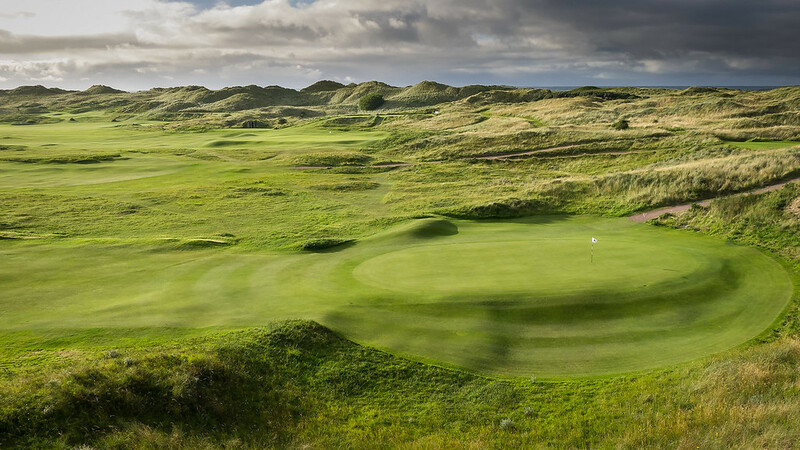 While wind will make any golf course challenging, the exacting nature of Royal Portrush means that the wind makes an otherwise challenging golf course oppressive in its difficulty. Looking back on my round and thumbing through the course guide I was struck by how easy the course appears from an aerial view. Again, there are few forced carries, it’s long but not ridiculously so, and the fairways appear wide enough. Then it struck me the true genius of the layout. The course is really as difficult as one chooses to make it. Most of the holes can be played along the ground. Most of the greens offer a very wide opening from which to approach. The challenge comes in when trying to play a typical American-type game. Playing high-arching shots in the hope of landing (and sticking) by pins is recipe for disaster. Playing for the front opening of greens and allowing for roll is a smarter play. So is Royal Portrush the kind of course that beats you into submission where by the end of the round you can’t wait for it to end? Is it as “cruel” as expected? Nothing could be further from the truth. First off, even if you shoot 65 on the front nine you will be greeted by the most simple and perfect halfway house in golf. If the flag is flying, stop in for a sandwich and an Irish Whiskey. There is nothing quite like enjoying a Bushmills neat in a proper glass in-between nines on one of the most beautiful sites in golf. That’s probably the only slight downside to Royal Portrush. The course and its scenery is so gorgeous you just want to take it all in. Unfortunately it’s one of the most demanding and attention-requiring layouts you’ll ever have the privilege of playing. Even though it kicked this 9 handicapper’s behind all the way to a 98, it’s a course I could play again and again. Remember this summer’s US Open at Chambers Bay? Remember the shots that seemed to be a couple feet off line that ended up 60 yards away from their intended target? I could see similar issues at Portrush when The Open Championship comes in 2019. The course is so hilly and plays so firm and fast for visitors, I can’t imagine how it will play under major championship conditions. Hole #14, Calamity, is one of the most visually stunning holes you’ll ever see. 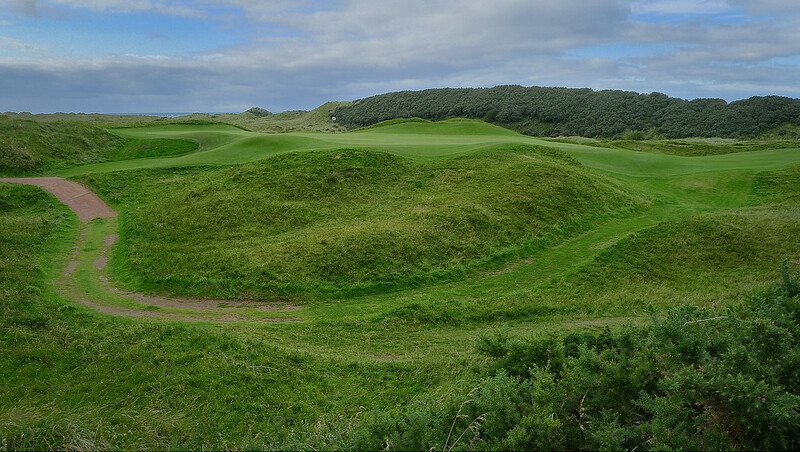 Not only do you play your shot over a cavernous ravine, the view onto the rest of the course from there (mostly the Valley Links course) is spectacular. What is less spectacular is the proximity of the 15th tee to the 14th green. The 14th the day I played it played about 200 yards from the men’s tees. Any shot pulled about 10 yards left of the green comes right down on 15 tee. One of the players in my group almost drilled the group in front of us. The group behind us DID drill us…or at least they drilled our trolley. It would be one thing if it was a easy short iron shot to a mild par 3, but this is a hybrid or more for most players. It’s not like it’s a precise shot for most players hence beware while playing off the 15th tee. I had heard that caddies were less-necessary at Portrush, at least when compared to Royal County Down. The reason for this is supposedly RCD features at least a half dozen blind tee shots, whereas Portrush it’s “all out in front of you.” While I agree Portrush is pretty straightforward, I do think a good caddy would be highly beneficial. There are a fair number of blind shots and the course is so tough that one should take all the help they can get. 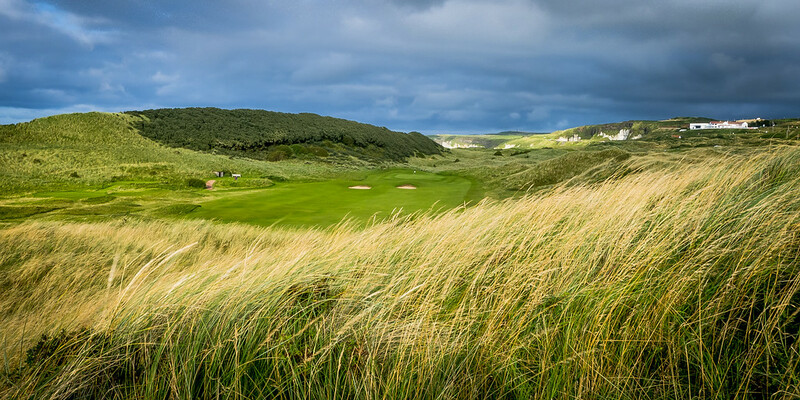 Overshadowed by its big sister, the championship Dunluce course, the Valley course is probably the third-best course in Northern Ireland. There is a wonderful set of par threes, and the rugged terrain outside the fairways minimizes the need for bunkers and other manmade hazards. Now we have to cross our fingers that the powers that be don’t ruin the Valley in the process of expanding its big sister to be Open-worthy.